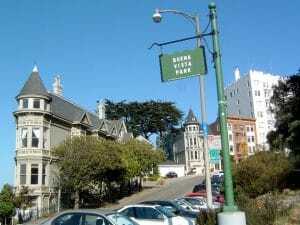 Alamo Square takes its name from the park at its center. The area is perhaps most famous as home to the Painted Ladies, a row of resplendent Victorian homes often featured in photographs and films. With picture perfect views of the cityscape in the distance, Alamo Square Park is often brimming with neighbors and tourists alike. Divisadero Street marks its western border where local restaurants, cafes and shops offer a variety of cuisines and goods. 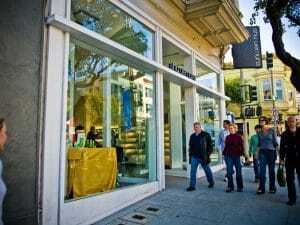 To the southeast, trendy Hayes Valley boasts high-end boutiques and is quickly becoming one of the most fashionable parts of the city. Actually, this is more than just a review of the Alamo Square area. 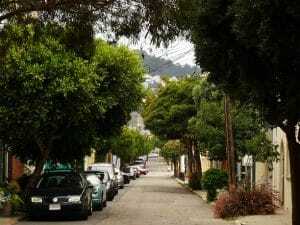 It’s really about the mile-long stretch of Hayes Street that spans east-to-west from Franklin Street all the way to Divisadero in the NOPA district. What you get is a chic, funky and creative mix of individually-owned boutiques, cafés and restaurants, a spectacular 12.7-acre park with panoramic views of downtown San Francisco as well as some of the most beautiful Victorian and Edwardian homes in the city all from a single stretch of street. The Hayes Street neighborhood’s proximity to the airport, both bridges, Golden Gate Park, downtown as well as its ideal location, a few short blocks to the San Francisco Symphony and Opera, make it one of the most culturally rich, convenient and just plain fun places to live. At the eastern end of Hayes Street, local merchants, residents and city planners have worked together to create an animated, pedestrian-friendly shopping and dining destination known as Hayes Valley. From the urbane to the everyday, the classic to the eclectic, there’s something to suit just about every taste. The nearby San Francisco Symphony, Opera, Music Conservatory and French American International School all contribute to this friendly, vibrant community that moves day and night. The new Jazz Conservatory being erected at the corner of Franklin and Fell Streets continues the march forward to maintaining the neighborhood’s reputation as San Francisco’s cultural hub. While I could list the many cool boutiques, cafés and restaurants that line this end of Hayes Street, the point is to go there and explore it for yourself. The merchants and residents have done an outstanding job of keeping the big chains out and keeping fun and creativity in. About mid-way up the Hayes Street mile from the cafes, boutiques and restaurants ofHayes Valley lies picturesque Alamo Square; a four-block, tree-lined park with amazing views of downtown San Francisco, the Transamerica Building, the Bay Bridge, all framed in the foreground with the famous row of Painted Ladies. Palms and colossal cypress trees line the wide paved paths that twist their way through this famous San Francisco landmark. The Alamo Square Neighborhood Association is very active and works continuously to improve park facilities to maintain the charm and improve access to this municipal treasure. Children and parents love the kids playground located on the eastern side of the park with its great views of City Hall’s beautiful gilded dome and downtown. Since the area around Alamo Square Park was largely untouched by the Great Earthquake of 1906, many of the original Victorian homes still remain. In fact, Alamo Square was a refuge for San Franciscans after the earthquake and citizens gathered on the Hayes Street side of the park to watch the city’s destruction from fire; many with only the clothes on their backs. Today, the neighborhood immediately around the park is a historical district and contains the second largest concentration of Victorian and Edwardian homes over 10,000 square feet in San Francisco. The Victorian Alliance, an organization committed to the preservation and restoration of Victorian and other historic structures, is very active in the Alamo Square area and schedules historic home visits and other related events on a regular basis. While the word bargain is clearly a relative term when referring to San Francisco real estate, the magnificent period homes in and around Alamo Square built between the late 1800’s to the early 1900’s are a bargain, selling at somewhere between 60 to 70 percent of the price of comparable homes in the Pacific Heights orRussian Hill neighborhoods. Continuing another couple of blocks west on Hayes Street from Alamo Square to the North-of-the-Panhandle (NOPA) neighborhood at Hayes and Divisadero, a kind of renaissance has taken place; some of it a result of positive vibrations from both Hayes Valley and from gentrification in the NOPA area itself. However, ample credit should be given to the beautification projects undertaken by the city in the past four years such as adding the tree-lined median strip down the center of Divisadero, making it less of a to-and-fro and instead, more of an actual destination. These improvements have encouraged merchants to move in and create some very cool shopping and dining attractions. One recent example is the much-anticipated opening of the new Bi-Rite Market and Creamery set to open in late 2012 next to Nopa Restaurant near the corner of Divisadero and Hayes. Just a block off Hayes Street on Divisadero, the modern music venue, The Independent, attracts some of the biggest names in popular and alternative music. Its intimate theater setting makes it a great place to see your favorite artist up close while still a big enough venue to hear it played good and loud. There’s really no other neighborhood in San Francisco that offers Hayes Street’s variety of eating, shopping, highbrow and lowbrow musical options, not to mention just plain old people-watching in Alamo Square or in one of the many cafés, and yet with such incredibly easy access to just about anywhere you may need to get to in the Bay Area. Just how easy, you ask? How about 19 minutes from Hayes and Steiner to curbside at SFO? The downside; you’ll get there so quick that you’ll probably have to circle the terminal a few times; that is, unless you’re particularly adept at finding anSUV to hide behind from the guys and gals in the reflective chartreuse vests waving their dang flashlights at you. But seriously, jokes aside, this is a place to remember. Take a date here, take a dog here, take your whole family here and move in. Hopefully into one of the beautiful Victorians. Similar to Buena Vista Park, Alamo Square Park has some really gorgeous views of the city, just from a lower point. Nearby Divisadero Street and Steiner Street provide all of your grocery and cuisine needs, as well as other stores that can provide you with specialty goods. A little to the east lies Hayes Valley, and with it shopping, shopping, shopping. This nabe has been gentrified in the past 20 years or so, but it hasn’t lost any flavor, it’s just become safer and nicer. It’s more diverse, and more interesting. You might even run into Danny Tanner! Okay, you definitely won’t run into Danny Tanner. But all in all, I give Alamo Square two thumbs up. Vibe: Steiner is probably one of the prettiest streets in the city and has couple of Inn’s, bed & breakfast types of places that are not well advertised. Divisadero has a lot going on, some great restaurants in the vicinity and groceries, what ever you can think of. Several bus lines, like the bus number 5 (costs you $2) takes you to either Ocean Beach or to Financial District) so either way you’re pretty much in the middle of the city. Biking or running to Golden Gate Park is fun way to spend your weekends, it takes about 20 mins or so to bike through the park to Ocean Beach to check if you see any dolphins or surfers or if you feel a like walk to the downtown, it’s 20 mins walk to Union Square and San Francisco Shopping Centre. And because of the fact being one of the most photographed tourist destinations in the city, parking around the Alamo Square Park is free. Thinking about kids, the playground is very clean and neat, local schools are not – but some parents are very community oriented and have some good stuff going on locally but like in general in San Francisco, public education seems not to be a priority here. Alamo Square has far too much tourist hype. If you’re a San Fran native, you’ll understand this best. Yes, great views and beautiful homes, but not at the expense of out-of-towners and a so-so park. Apartment rental prices aren’t the worst in the city, but I’d recommend nearby Lower-Haight to Alamo if you’re looking to move to this area of town. 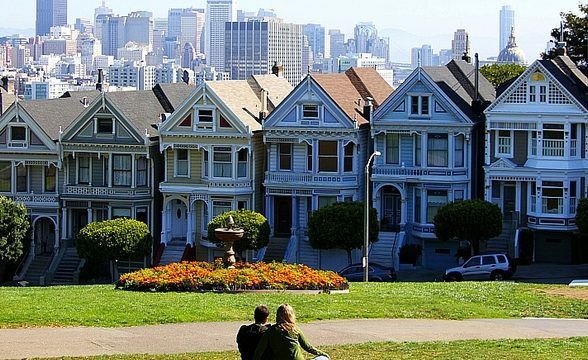 Perhaps most popular from the 1990’a sitcom “Full House,” Alamo Square is home to the “Painted Ladies”: the homes featured in the show’s opening credits. I always love visiting Alamo Square because it is so picturesque with the park and surrounding Victorian homes. I constantly see a m lange of young professionals and families. It is within easy walking distance to Divasdero Street and a variety of newer, trendy restaurants. It’s also very close the N on Muni and multiple bus lines. Alamo Square shows off San Francisco with style. As one of the more famous vantage points to view the city, tourists flock here to get the picture perfect postcard shot. So if you don’t mind steady crowds photographing your neighborhood then Alamo Square is an ideal place. A few blocks east is Hayes Valley, a shopping mecca and the up and coming NOPA is westward. And although the park and the views attract crowds, the residential streets are quiet and lined with some Victorian stunners!